This is the sixth year with Gardener Cary George in charge of the Garden. 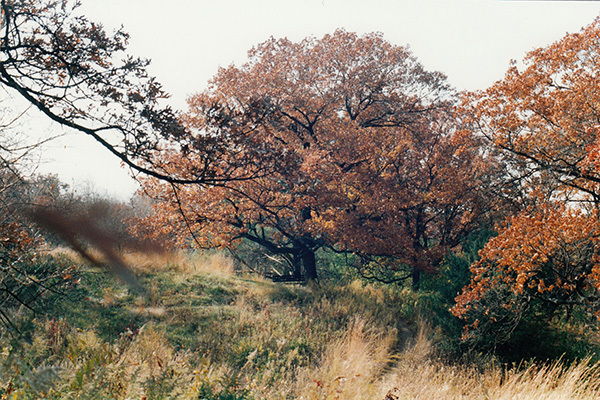 During the late winter months Gardener Cary George reported extensive work on cutting and removing Buckthorn, Tartarian Honeysuckle and weedy Boxelder from the area along the back fence. That area was to have the fence realigned and a new back gate with stonework installed. 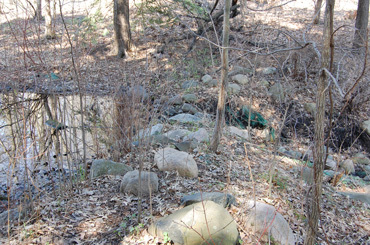 Landscape architect Sandra Welsh of the Minneapolis Park and Recreation Board had secured an Open Space Habitat Improvement Grant to realign the walking path, dredge the pond, and create a rock outcropping and waterfall in the water channel. The Friends would provide money to rebuild the back gate with stonework. Work was expected to begin in April. The new dam was a replacement for the concrete dam that was in the same place, going all the way back to Eloise Butler in 1917 and that 1917 dam replaced an older earthen dam that Eloise had created when the Garden was first established. (history) The 1992 re-arrangement of the fencing and dredging the pool created the current outlines of the small pool at the back of the Garden. (1) The fence from 1938, angled southward toward the dam from the two back corners of the Garden. Outside the fence was the old bird feeding station. The new alignment moved the fence northward away from the dam, removing the angle and the bird feeding station. Maps shown below show the before and after. 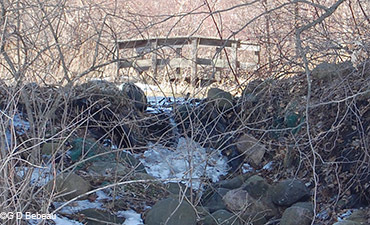 The rocky outcrop in Winter seen from below the pool outlet - seen here in 2008 with the 1990 vintage cedar bridge still in place. The bridge was replaced by a boardwalk bridge in 2015. In the Friends Newsletter, The Fringed Gentian™, (2) Cary George wrote that the back gate used to be the most convenient entrance to the Garden when people arrived by foot or Streetcar. The realignment of the Garden's back fence. The maps seen below show the changes at the back of the Garden. 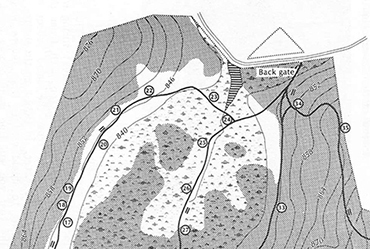 In the 1987 map we see that the old fence angled southward to where the dam was before reaching the back gate. 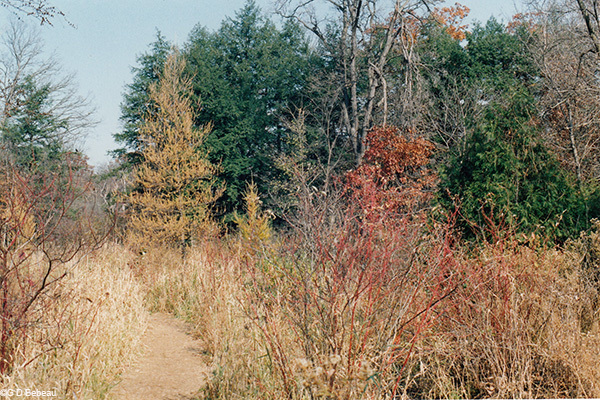 The old tarvia path, going back to Eloise Butler's time, is shown following the fence line. 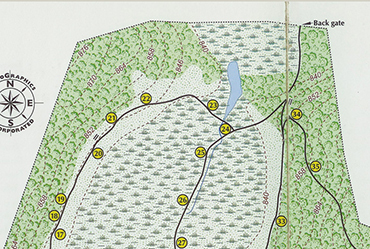 The 2001 map shows the fence realignment with the fence moved northward, creating an open area between the dam and the fence. The old path outside the Garden space was moved to follow the new fence line. It is evident from viewing the texture and condition of the current path along the realigned portion of the fence that it is of newer age. Also there is an abrupt directional intersect of the old portion of the tarvia path with the newer portion and the difference in pavement age is evident. The Winter of 1991/92 was one of the snowiest with total snowfall around 85 inches, well above the median of 43 inches, but it was all melted by late March with the Garden being able to open on time. (1) Background study (pdf) of the Mallard Pool and other open water in the Garden. Directors elected were: Ken Avery, Geri Benavides, Harriet Betzold, Betty Bryan, Elaine Christenson, Sallie Cole, Mel Duoos, Dale Johnson, Ann Kessen, Connie Bartz-Lavoie, Gloria Miller, Shirley Schultz, Joyce Smeby, Kathryn Stennes. Elected to their offices at the Board of Directors meeting: Joyce Smeby, President; Harriet Betzold, Vice-President; Ann Kessen, Secretary; and Connie Bartz-LaVoie, Treasurer. Betty Bryan was membership chair, Elaine Christenson was memorials chair, Shirley Schultz was Volunteer coordinator, Dale Johnson was historian, and Kathy Stennes was newsletter editor. 41 volunteers were on the active list. 227 on the membership list. Eloise Butler biographer Martha Hellander attended the meeting and thanked The Friends who had contributed substantially to her expenses in producing her book on the life of Eloise Butler - The Wild Gardener. In June she and her family were moving to Chicago. Gardener Cary George made a presentation on the state of the Garden. The Spring bloom was about a week behind normal as April was damp and cloudy and then in May so far there had been only 1/4 inch of rain. He had ordered specimens of New Jersey Tea to plant around the main garden sign in the parking lot. Work on the back gate and fence had not yet begun and the completion date was unknown. In the Newsletter new Friends President Joyce Smeby noted that 1992 was the 40th Anniversary of The Friends and the 85th of the Garden. Park Naturalist Sarah Christiansen reported that the first male Indigo Bunting was sighted in the Garden on May 11 and the females arrived toward the end of May. Memorial day was 34 degrees. The Showy lady’s-slipper bloomed on June 2nd. On June 9, the Friends hosted a get-together and potluck dinner for Garden Volunteers at the Martha Crone Shelter. The new slide presentation was shown. Martha Hellander was on hand on Saturday June 13 for book signing of her book The Wild Gardener which was published in May. On Sunday August 2, commemorating Eloise Butler’s birthday a special stamp cancellation by the U.S. Post Office, using a wildflower stamp, was held at the Garden. Friends member Dan Miller helped with the envelope design. Martha Hellander returned from Chicago to sign copies of her book on Eloise Butler. Over 200 people attended. The Fringed Gentian™ had a report on Friends' founder, Clinton Odell. Work on the back gate project was finally underway on August 3rd with dredging for the new pond and moving the fence. The Friends donated $2,000 to the project. A new roster of Friends members was being readied for publication and release in the Winter. The naturalists discovered the nest of a short-tailed shrew, a venomous mammal, just under the birdfeeder in front of the shelter. As to the weather, this summer had the 2nd coldest July on record, coolest since 1865. 80+ degrees reached only four times. The entire Summer was very cool with lots of rain, which has been attributed to the eruption of Mt. Pinatubo in Asia. 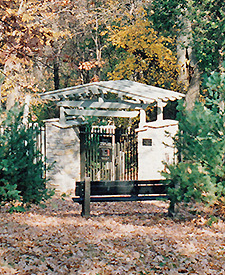 The bird feeder at the back gate in Fall 1992. Photo G D Bebeau. In the Friends Newsletter, The Fringed Gentian™, (2) Gardener Cary George listed the 11 asters and 7 species of goldenrod in the Garden. The re-aligned back fence and new path is mostly done. The waterfall at the edge of the pool is in and a new path to view it is in place. Park Board carpenters were building a new rough-cedar birdfeeder for inside the back gate and the front gate and Audubon had agreed to continue winter feeding - something that had been done for many years, begun by Miss Lulu May Aler in the 1930s, and continuing through Martha Crone's tenure. When Miss Aler could no longer do it, the Minneapolis Bird Club took over. 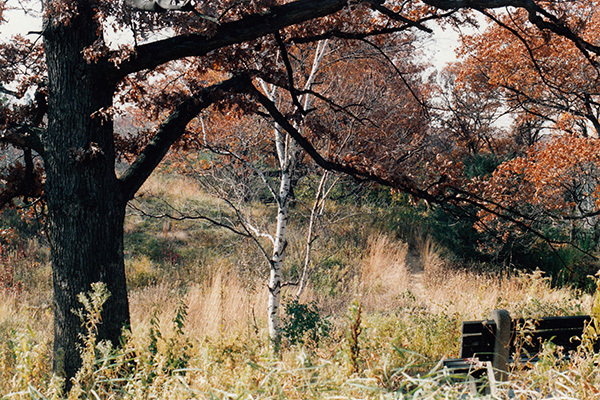 They became part of Audubon but in the meanwhile, Ken Avery took over caring for the feeders until his retirement. The back gate re-construction itself was to wait for future years (1995). 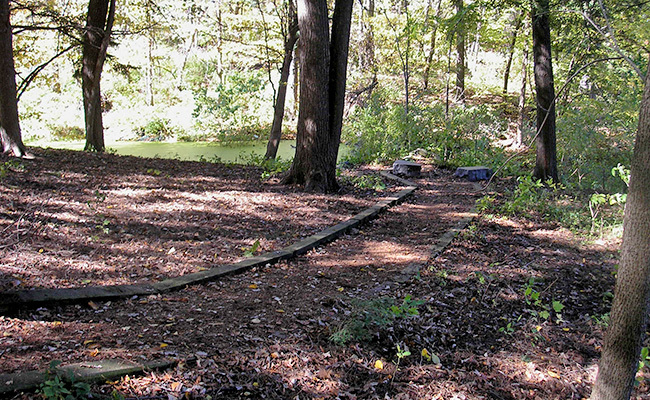 Below: The path leading to the newly dredged pool and waterfall - both created in 1992, shown here in 2007. The stone seats from Drake Marble were funded by The Friends in 1993. 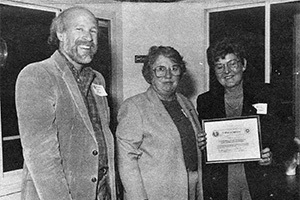 Elaine Christenson was awarded Outstanding Volunteer for 1992 by the Park Board. Photo from Park Board Volunteer Banquet: (l to r) Scott Neiman, President, Naomi Loper, Commissioner, and Elaine Christenson. Forty-six volunteers of the season were recognized in the December issue of The Fringed Gentian™ and Friends’ volunteer Elaine Christenson was awarded Outstanding Volunteer for 1992 by the Park Board. Friend’s volunteers provided 1050 staffing hours during 1992. At the end of 1992 the Friends had financial statement assets of $45,700. 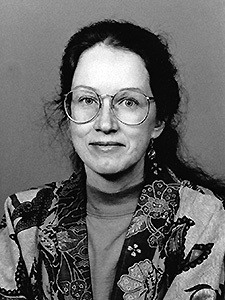 Revenue for the year was $11,800 with $5,800 from memberships and $4,700 from sales of Martha Hellander's book. Expenses were $8,100. Unlike the previous year the Winter of 1992/93 would have a typical amount of snow. (2) The Fringed Gentian™ Vol. 40 No.3 Sept-Oct 1992 and Vol. 40 No.4 December 1992.